Time and information are precious commodities when you are a teacher. That’s why the Australian Government has created Scootle Community, a new information hub, where you can share ideas with peers around the country and quickly access high quality teaching and learning resources. Scootle Community is an Australian first: a teacher-specific channel for information and interaction. Developed in collaboration with the Australian teaching profession, Scootle Community is a private space for teachers to give and receive advice and information online. The latest addition to the Scootle suite of tools for teachers. Scootle Community has capacity to link to every teacher in the nation in a professional digital community.Whether it is lesson plans, resources and research relevant to the Australian Curriculum or just a helpful peer perspective on a classroom challenge, Scootle Community puts a world of ideas and information at your fingertips. Scootle Community is fully searchable, and can be personalised to alert you to discussions about the year level, learning area or topics that inspire and interest you. Tap into our best learning resource – the community of teachers – anywhere, anytime. To find the Scootle community visit http://community.scootle.edu.au/login or click on the Community tab on the Scootle homepage. 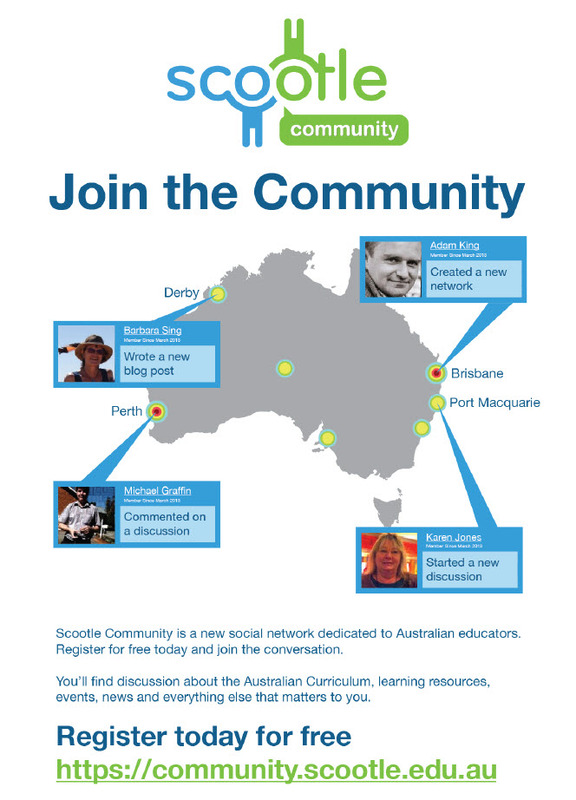 Scootle Community is free and open to anyone with an edu.au email address and you can use your existing Scootle login to access.